Netflix just released the Jessica Jones series this week to an awesome reception from Marvel comic book fans and non-fans alike. Many probably have or had no idea who Jessica is and that's alright, but if you did have some knowledge of the character then you probably noticed a nod or two while watching the series. I don't think I should have to say this, but there will be spoilers from here-on-out. Not just spoilers for this season but possible spoilers for next season as well. So just to be clear, there will be SPOILERS below. You've been warned. Jessica's real name was Jessica Campbell. She was present when Peter Parker was bitten by the irradiated spider which gave him his powers. She had a crush on him, and had just plucked up the courage to speak to him when he was distracted by the bite. Jessica's father received tickets for Disney World from his boss Tony Stark (Iron Man). On the way home, their car collided with a military convoy carrying radioactive chemicals. Her family was killed, and, after spending several months in a coma, she awoke, stirred by the first coming of Galactus outside her hospital room. She was placed in an orphanage and adopted by the Jones family. Jessica later discovered that her radiation exposure granted her super strength, limited invulnerability, and flight. She later witnessed a fight between Spider-Man and Sandman in her class, which inspired her to use her abilities as a hero. Jessica's first attempt at being a hero cam in the form as Jewel. Jones was an upstart hero with a fairly uneventful career until she intervened in a disturbance at a restaurant involving longtime Daredevil foe Zebediah Kilgrave (the Purple Man). Kilgrave used his power of mind control to place Jones under his command, psychologically torturing her and forcing her to aid his criminal schemes. After eight months, Jones began to lose the distinction between his will and her own. Kilgrave then sent Jones to kill Daredevil, erroneously directing her to the Avengers Mansion. Jones attacked the first hero she saw there in a red costume, the Scarlet Witch. The mind control began to wear off and Jones attempted to flee, but she was caught and severely injured by the Vision and Iron Man. She escaped due to the intervention of Carol Danvers (Ms. Marvel), the only Avenger who actually knew her, and she took her to safety. Jessica opened a private detective agency after that and quit being a superhero. Given her background, she was sought out by clients with superhero connections. Despite her wish to leave the superhero life, she found herself repeatedly drawn back into it. Longtime friend Carol Danvers set Jones up with Scott Lang (2nd Ant-Man), and the two dated for several months. 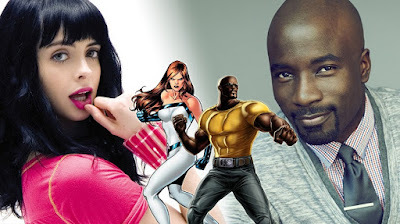 She also had an off-and-on affair with Luke Cage. Kilgrave, still obsessed with Jones, escaped from high-security incarceration. He attempted to break her spirit by making her experience her worst nightmare: discovering Lang and Cage in a tryst with her friend, Danvers. This time, the mental defenses Grey had given her allowed Jones to free herself from his control. She knocked him out and he was recaptured. Luke Cage and Jones admitted their feelings for each other and after becoming pregnant with his child, Jones and Cage began a committed relationship. Luke Cage, born Carl Lucas, was setup and imprisoned after Willis Stryker plants drugs on him and calls the cops. Luke is consumed by rage over Stryker's betrayal and engages in frequent brawls and escape attempts. Eventually he is transferred to Seagate Prison off the coast of Georgia where research scientist Dr. Noah Burstein recruits Lucas as a volunteer for experimental cell regeneration based on a variant of the Super-Soldier process he had previously used to empower Warhawk. Burstein immerses Lucas in an electrical field conducted by an organic chemical compound; when he leaves Lucas unattended, Rackham alters the experiment's controls, hoping to maim or kill Lucas. Lucas' treatment is accelerated past its intended limits, inducing body-wide enhancements that give him superhuman strength and durability. He uses his new power to escape Seagate and makes his way back to New York, where a chance encounter with criminals inspires him to use his new powers for profit. After a one-night stand with a drunken Jessica Jones, Cage's life is briefly thrown into disarray by Jones' reaction to the fling. The two make peace while working as bodyguards for Matt Murdock (Daredevil). Cage extends emotional support to Jones when she is forced to revisit past abuses by Kilgrave and Cage's feelings for her grow. When Jones reveals that she is pregnant from their tryst, she and Cage move in together. Soon afterward, Jones becomes a superhuman consultant with the Daily Bugle. After she is attacked by the Green Goblin during a Bugle investigation, Cage, helped by Spider-Man, deliberately attacks Norman Osborn in order to provoke him into revealing he is the Goblin. Luke and Jessica then have a daughter, whom they named Danielle, in honor of Danny Rand. Soon thereafter, he and Jessica are married. That's just a quick overview of their history together in the comics. Now if you have watched the show then you know there is some major variations, but they are made for the better and to ground the series in a more realistic way. Hopefully though we will see the marriage and baby in a later season, but I can not figure out why they did do a Daredevil cameo given his history with the Purple Man. But this is only the beginning and I'm sure they will cross over at some point.